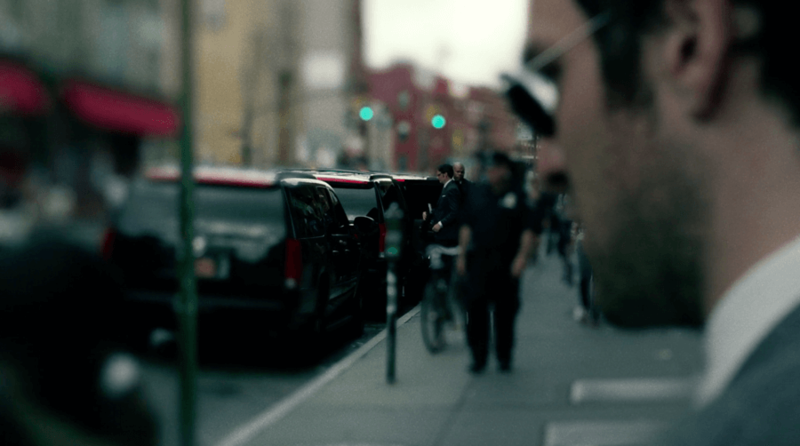 It’s time to review the third episode of Marvel’s Daredevil. Here we go! It all starts with a man walking into into a bowling alley, and what comes next is no joke. Under the pretense of just looking to bowl a few rounds with a Mr. Prohaszka (a name we remember from the conference of villains up on the roof in episode one), our outwardly friendly newcomer provokes Mr. Prohaszka and his men into a huge fight that ends with assassination by bowling ball. This after the gun the mysterious stranger had purchased from Turk (revealed to us in a quick flashback to 36 hours earlier) jams up. After the dust settles, he hides the gun in a pinball machine and gets into position for the police to come in and arrest him, following the phone call from the frantic young girl at the desk. After the theme plays, we find Matt sitting outside his church, looking every bit as uncomfortable as you might imagine considering what his body went through in the very recent past. Father Lantom shows up, recognizes him as “Jack Murdock’s kid” (and as the same man whose confession he heard in episode one) and offers him a cup of coffee. Matt declines and gets up to go to work. 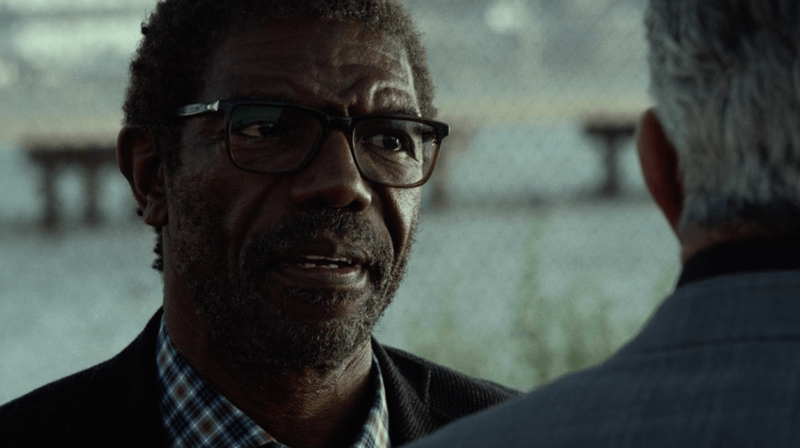 Next up, we get out first look at Ben Urich, played by Vondie Curtis-Hall, who is meeting up with an old mobster, Silvio, who is looking to leave town and move to Florida. Ben tries to get information from him, as he quite clearly has in the past, but Silvio speaks mostly in riddles, though he does inform Ben that Rigoletto (whose territory was recently claimed by Wesley’s “employer,” as we recall from episode one) is dead, as opposed to “retired.” There’s a real sense that the streets are getting meaner. We switch to Karen who is sitting at her desk in the office reading some clearly disturbing mail when Foggy shows up, hung over. The two debate getting a sign on the door when Matt walks in. Matt looks like he’s had a good beating (which we know he has), and Foggy pesters him about getting a dog before they are interrupted by the more important fact that someone is knocking on the door. Enter Wesley! In the next scene, Wesley states his case in the Nelson & Murdock conference room, and explains that he’s looking to put them on retainer. Matt is very skeptical of their new potential client while Foggy tries to smooth things over. When Wesley makes a reference to Karen’s case, they know he’s up to no good. Still, they take Wesley up on his offer to review one of their cases. Curious, Matt goes after Wesley when he leaves – much to Foggy’s dismay – and overhears him talking to Fisk as he gets into his car. After Wesley takes off, Matt notices that he’s bleeding through his shirt. Meanwhile, Foggy interviews Mr. Healy whom we first met in the first scene. Foggy is very uncomfortable around his new client who appears chillingly calculating and is ready to decline representing him when Matt finally shows up (wearing a different shirt!) and suprises Foggy by quite enthusiastically arguing that they take the case. We briefly cut back to Ben Urich, now at work, and on the phone with an insurance company. After he hangs up, Ben goes on to have a very depressing conversation with his boss Ellison who would rather see Ben devoting himself to things that sell. Stories about organized crime presumably do not. We now go back to the conversation between Matt, Foggy and Mr. Healy, and see Matt go into full interrogation mode, hoping that attorney-client privilege will make his client forthcoming enough to give them information on Wesley. Foggy takes Matt aside and tries to convince him that they shouldn’t take the case. No such luck, Matt’s interest has clearly been piqued by where this all might lead. Speaking of Wesley, in the next scene we see him swing by the bowling alley to pick up the gun that Healy left under the pinball machine. When the two law partners get back to their office, Foggy unsurprisingly has some things to say about Matt’s complete change of heart regarding the case. Matt apologizes and the two agree to make future decisions together. They then start planning the case, only to realize that Karen is not at her desk. It turns out that Karen, in response to the letter she received earlier in the episode, has a meeting with her old employer who is looking to offer her money in exchange for her further silence on the topic. And, we’re back to Ben Urich who is having a conversation with the manager at the hospital where his wife is hospitalized. She agrees to do what she can regarding the situation with Ben’s insurance policy, and Ben stops by to see his wife who is sleeping. Back at the office, Matt and Foggy are struggling with poor wifi while doing research for their case. Foggy is finally able to find what they need for their defense. Next we see the case go to court, and Foggy making the opening argument. When Foggy goes to sit down, Matt catches something off with the heartbeat of one of the jurors, which he connects with Wesley entering the room, as indicated by the tick of his watch. In the next scene, we see the juror meet with the man who threatened her. He is reminding her to do her part as instructed before being attacked by Matt in his black mask. The bad guy reveals what he has on the juror, but claims to not know the name of the person he is working for. Matt instructs him to tell the woman to excuse herself, and then get out of town. In the next scene, right before Matt gets ready to give his closing argument, we see the juror who was tampered with be excused from jury duty and replaced. Next, it’s showtime for Matt who listens closely to the people in front of him to detect whether anything is off about them. When prompted by the judge, he starts talking, focusing mainly on the difference between legal matters and morality. Next up, we see Leland Owlsley and Wesley in a car together. Owlsley is concerned about the messes they’ve created. When he asks to see Fisk, Wesley informs him that he’s busy looking at art for his penthouse, which gets an exasperated reaction from Owlsley. In another part of town, Karen goes to see Mrs. Fisher, the wife of the man who died in her apartment. Mrs. Fisher is moving out and tells Karen that she’s already signed the papers from Union Allied. At this point, it’s clear that Karen is not ready to give up and we next see her visiting Ben Urich at his office, telling him that there may be more to the story about Union Allied. We return to the courtroom, where the jury is back. Matt quickly realizes that someone else on the jury has been tampered with. He correctly predicts that they jury have been unable to reach a verdict and Healy is released. Matt, in his vigilante outfit, waits for Healy after dark, and the two have a long fight. 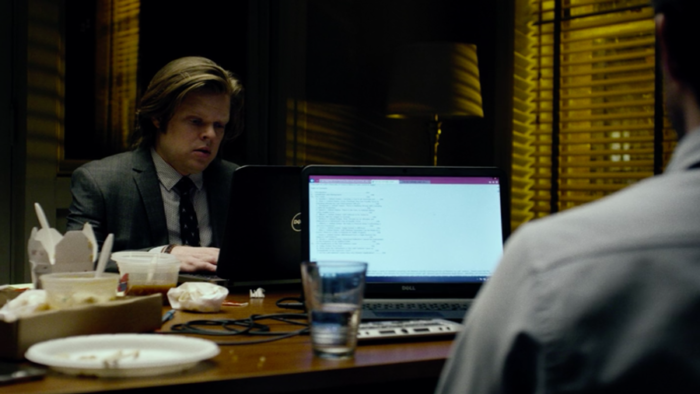 Healy finally gives up the name “Wilson Fisk” and then kills himself by jamming his head into a metal spike, for fear of what will happen to him and his loved ones. 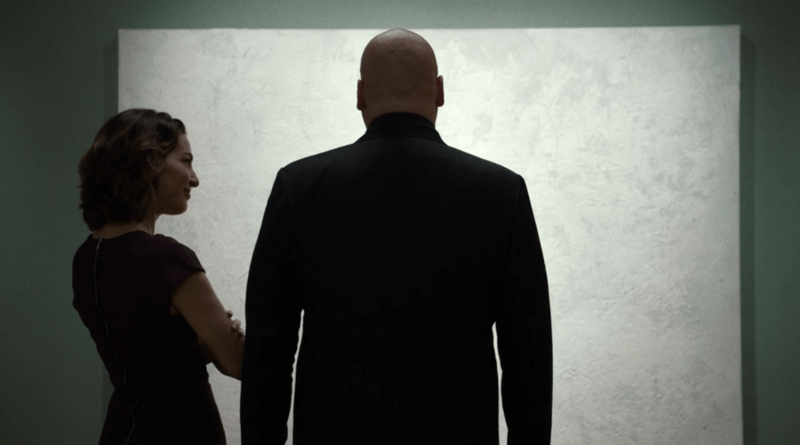 In an upscale gallery displaying abstract art, Vanessa approaches Wilson Fisk who is looking at a painting of gradations of white. She strikes up a conversation about art, and Fisk admits that the white painting makes him feel alone. It’s an interesting first scene for Fisk. There is much to love about this episode as well. 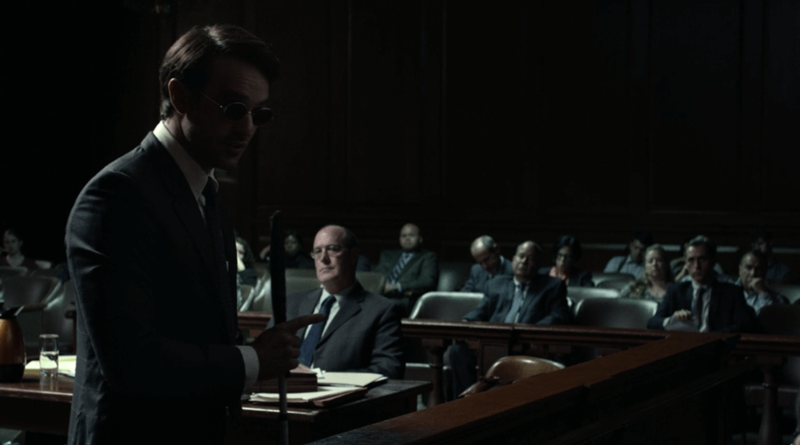 We see the “proto-Daredevil” action take a back seat – it’s safe to say Matt needs a rest after the previous episode – and more focus on the legal side of things. At the same time, new characters are brought into the story, such as Ben Urich and the much anticipated Wilson Fisk. The first scene keeps things as violent as ever though, as the character John Healy is sent to take out Mr. Prohaszka, under the pretense of wanting to join him for a couple of rounds of bowling. Things get messy when his gun jams up, and he has to resort to breaking bones and crushing the man’s skull with a bowling ball. Will I ever be able to go bowling again without thinking of this scene? Doubtful. It’s a good thing I don’t go bowling very often. 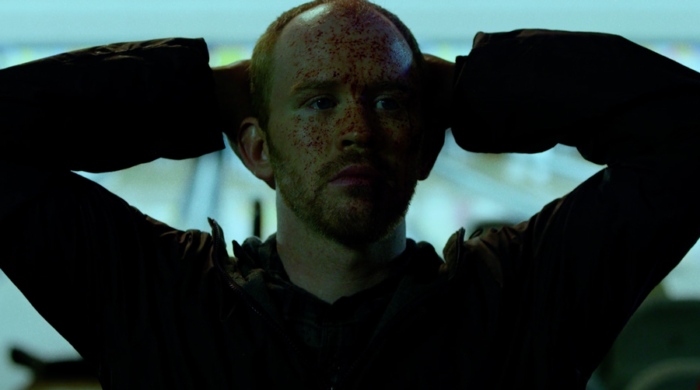 What really gets me about this scene though, aside from the graphic images of blood spatter and bones protruding through skin, is the cold and matter-of-fact demeanor of the attacker. As we’re about to see, it gets even worse. Ben Urich has a strong and interesting opening scene talking to an old mobster looking to leave town. Their conversation reminds us of a bygone era where even the bad guys had some kind of standards. The new threat in town – Daredevil fans will know him by the name of Wilson Fisk – appears to operate on a completely different and more brutal level. Ben Urich is a journalist who’s been on the job for a long time, and has built a network of informants along the way, and this scene does a fine job of showing us that. In later scenes, when he clashes with his boss about what should and shouldn’t go in the paper, you can sense that the old-fashioned way of doing things, by digging deep and methodically to build a story, has gone out of style. While the scenes with Ben’s wife Doris, and her caretakers, help round him out as a person and give him more of a backstory, they tend to drag on a little too long. This is really my only gripe as far as this episode is concerned. While I found no obvious Easter eggs in this episode, the interplay between Matt and Foggy feels like something straight out of the comics. By this I mean specifically Matt’s erratic behavior. He changes his mind about taking the case, and doesn’t tell Foggy why, and he randomly takes off when they’re about to go interview their client. Of course, we as the viewers know why Matt is behaving the way he does, but Foggy doesn’t, and this was pretty much what their routine looked like for the three decades that passed before Foggy found out Matt’s secret. Another classic Matt Murdock trait that really gets him in trouble this episode is his hubris. We saw him get in over his head last episode, and here he does it again in legal matters. Matt has always had a tendency to overestimate his ability to consider every variable and control many of the things that later turn out to be outside of his control. Sure, he can handle one juror who’s been tampered with, but is genuinely shocked when things don’t turn out the way he’d planned. As much as I felt his horror at this realization, there’s no denying that he at this stage in his legal and extracurricular “careers” approaches things with a certain naiveté. 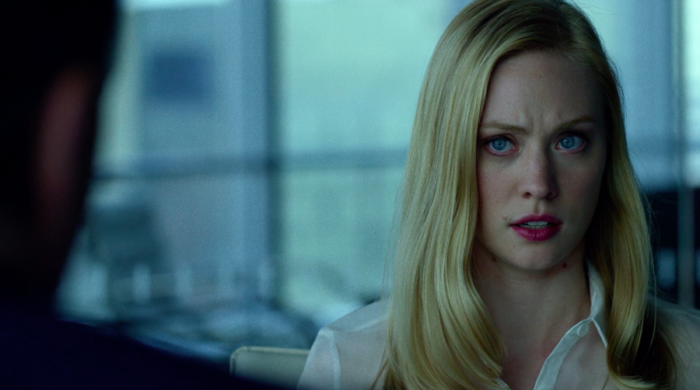 Speaking of Matt and Foggy’s case, their client is amazingly creepy all the way through this episode. After killing a man with his bare hands, he is shown trying to subtly threaten and manipulate his lawyers, safe in the knowledge that he cannot be touched. It’s easy to see why Foggy, initially happy to do almost anything for a much needed paycheck, feels uncomfortable enough to want to back out completely when he realizes what kind of monster he’s dealing with. What is interesting though is that this guy, whose mere presence is extremely threatening, is reduced to a quivering mess at the thought of what Fisk might do to him and those he cares about. He decides that killing himself in this unimaginably brutal way is a better way to go than what might happen to him in Fisk’s hands. This goes a long way to establishing our main villain as a major threat who will stop at absolutely nothing to exercise his power. This in turn provides such an interesting contrast to the setting in which Vincent D’Onofrio’s Wilson Fisk finally appears. He is decorating his penthouse and is looking for artwork. He probably didn’t expect to find love. I loved this scene. Vanessa, played by the stunning Ayelet Zurer, doesn’t shy away from the silent and mysterious giant of a man in her gallery, and overwhelms him with her presence. She displays both a profound love of art and the ability to not take things too seriously, and it’s easy to see why Wilson would fall for her immediately, despite his best efforts. The scene is not only well-written and well-acted but a complete joy to look at. I really liked the way Matt’s senses were used in this episode. There’s the ominous tick of Wesley’s watch that becomes Matt’s go-to signal for detecting his presence and, by extension, his witness tampering. There’s a lot of sensing the heartbeats of the jurors, and generally sizing them up. It feels very much like something Matt would do in the comics. I also want to point out the, once again, fantastic sound effects in the final fight scene, where Matt hears the bucket and, what I think is a metal bar, being picked up. While he doesn’t use it (yet), Matt has a braille display hooked up to his computer. The actual web surfing is left to Foggy in this scene though. There’s nothing in particular that stands out to me this issue. Did you notice anything I missed? I think I’m going to go with Wilson Fisk. Not the man himself so much as the vast empire he’s building. We only see Fisk in the flesh in the very last scene, but his influence is all over this episode. It’s in John Healy’s heinous first act, in Wesley’s ability to clean up his mess through the manipulation of the legal system, and finally in Healy’s intense fear in the moments before his death. The idea that there is a new order to things is also emphasized by Silvio, the mobster looking to get out of town. There is tension building in the episode and Fisk is at the root of all of it. Wasn’t Foggy’s comment about Matt getting a dog from the 2003 film? Best quote of the episode is either Matt’s entire closing argument or Turk guaranteeing the gun won’t jam. I liked this ep, but was confused by the jury-tampering plotline. Wesley arranged for a hung jury. Was Matt hoping his client would lose? I thought his argument was pretty good — was he supposed to be half-assing it? I like that they try to bring Matt and Foggy’s actual day job into the story. Too often superheros don’t seem to have a job, leading a person to wonder how the heck do they pay the rent? Compounded by these guys being new lawyers with no clients. The “retainer” check Wesley gives them explains how these guys have the money for food and bandages through the rest of the series. It shows these guys might be smart, but they’re inexperienced and still learning. In some ways, the violence in this episode is ever more brutal than the epic fight scene in episode 2. It’s one of the reasons I had to explain to someone at work yesterday that he probably does not want his young children watching this with him. Oh, and people have been saying to Matt he should get a dog for a long time, off and on. He won’t, though, for two reasons. One, he doesn’t need a dog and knows it, so he won’t get one (the supply is not unlimited and Matt won’t take that sort of resource that other people need more) and two, what would he do with the poor thing when he dashed off to do the superhero thing? Tossing a cane aside is one thing, you can’t ethically do that to a living creature. Urich’s boss Eliison reminds me of Fletch’s boss Frank (who is also a newspaper editor) from the movie ‘Fletch’. i watched the 1st 10 episodes on the 1st day, started at 3:30ish am, watched the 1st 2 episodes, then had to take my wife to work,came back home, made some food and settled back in to watch ,what i felt [and still do] was already a terrific show. started this episode and i was not prepared for the brutality. i literaly yelled “OH $h!t!” at both the bowling ball, and the self impalement.i couldnt believe disney was going all in like that for this show. now, granted, you cant actually see most of the carnage, but there is a lot of blood. the most graphic scene was Prohaszka getting his arm broken in the ball return. yikes. this makes me hopeful for a Punisher series in the same vein as this.